Is it a bug? 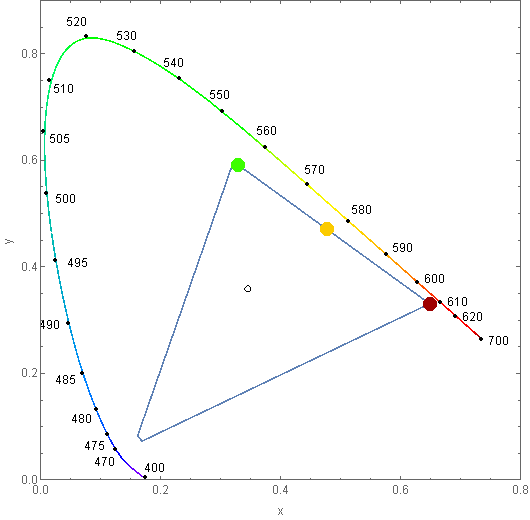 How to visualize the visible spectrum in Mathematica correctly? 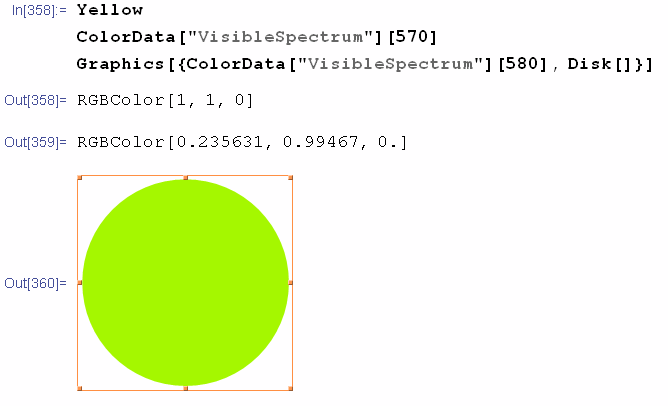 It doesn't seem that you'll be able to obtain Yellow (RGBColor[1, 1, 0]) from ColorData["VisibleSpectrum"]; unfortunately, the docs say nothing about how they're blending the colors to produce "VisibleSpectrum". For converting wavelengths to CIE xyz coordinates, see this thread; the current version of Mathematica now has built-in (but undocumented) functionality for the CIE CMFs. Alternatively, I also posted serviceable approximations of the CMFs as well in there. 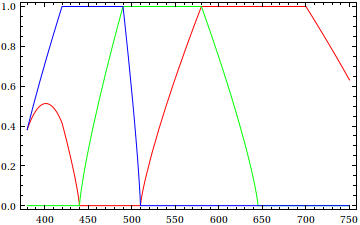 Clearly the three values are offset from the labeled wavelengths along the perimeter. 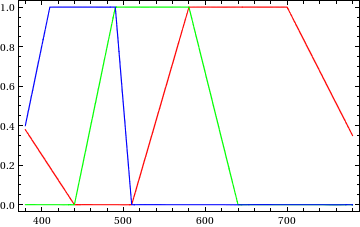 The position of ColorData["VisibleSpectrum"] can be explained by the fact that gamut is compressed. Based on the positioning I propose that the other values along that edge were offset by a similar degree resulting in the distortion of color that is the topic of discussion. I just had a look at the colours as they are produced on my screen. 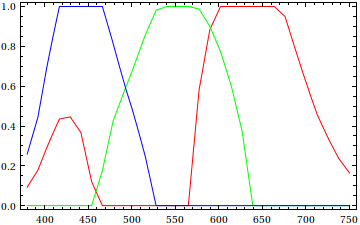 I have been working with lasers for many (30+) years and can assure you that a 591nm laser line is fairly yellow, around 635nm is fairly red and 488nm appears as cyan, which resembles the colours of the disks well. Are you sure you are not confusing the wavelength of the maximum of black body radiation and its apparent colour with that of single lines? A perfect match of the numbers is not required but their ratios should be close. 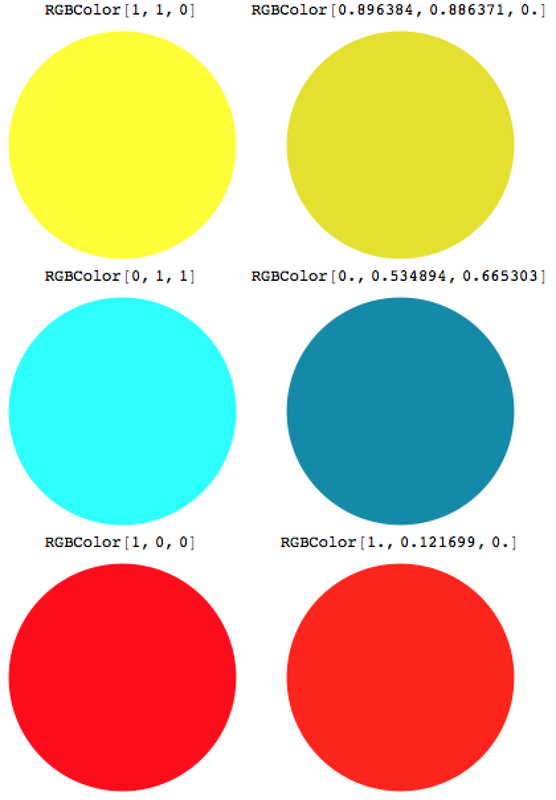 This is a bug (or an imperfection) of ColorData["VisibleSpectrum"]. 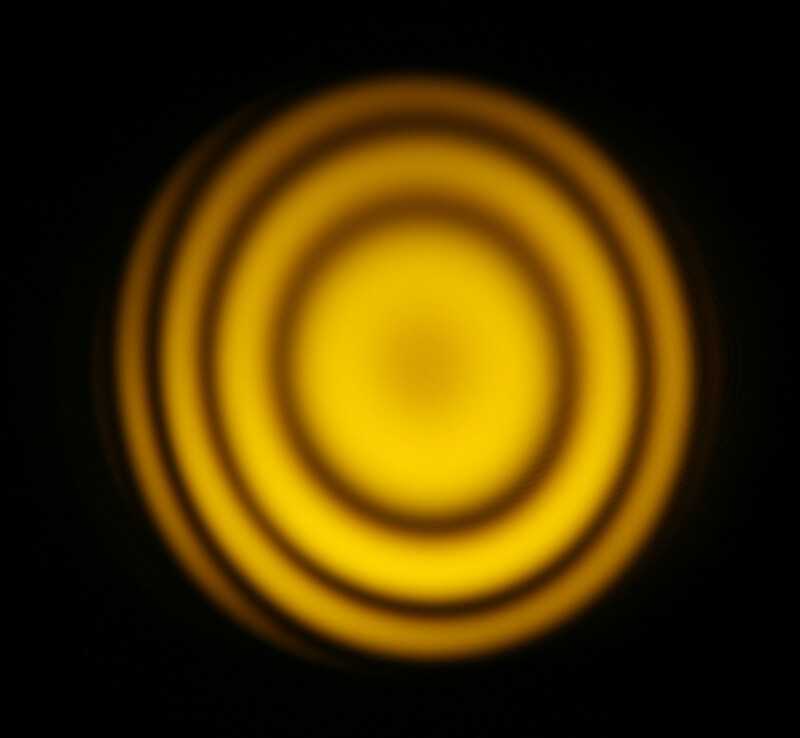 Others have delved into its root, but in my answer I simply will make it clear by a comparison with an experimental, known single wavelength color: sodium’s D-line at 589.0 nm. Well, almost single color… the two lines are not that far apart. 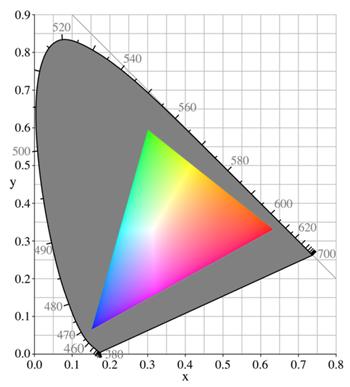 Never forget that fact that it is simply impossible to display any spectral color on a screen! 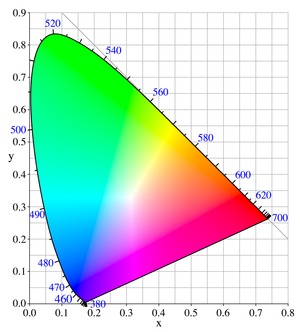 Spectral colors in RGB will produce Red/Green/Blue values above 255 or below 0, When it's RED = 380 or -600, the difference between what's displayed and what it should be is SIGNIFICANT. This rendering gives you a visual result which is close to what spectral lights viewed in daylight conditions look like, and it is more exact than anything else I.M.Opinion. The code that creates the above figure is given below. Not the answer you're looking for? Browse other questions tagged bugs color visualization physics perception or ask your own question. 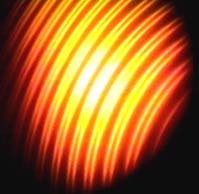 A way to calculate colour from wavelength? Using indexed array elements as integration dummy variables with EvaluationMonitor. Bug?